India is the biggest producer of Tuval Dal . Tuvar (Pegion Pea) is popular pulses ,as an important source of protein in a mostly vegetarian diet. Even fresh young tuvar pods are eaten as a vegetable in dishes . In Etiopia , not only the tuvar pods, but also the young shoots and leaves are cooked and eaten .Tuvar dal is everyday dal in many Indian home and almost all the region has some preparation using tuvar dal. Tuvar dal cooked with a little turmeric and salt tastes heavenly with just a little ghee. I love it with rice. But whenever i see a unique dal combo or something unique in the seasoning which is region specific i love it bookmark and one such dal preparation UP Style - Tuvar Dal @ Maayeka . This tuvar dal recipe came out very tasty and loved the use of fennel seeds in tadka . I made a few small changes . Wash and soak tuvar daal for 20 minutes . 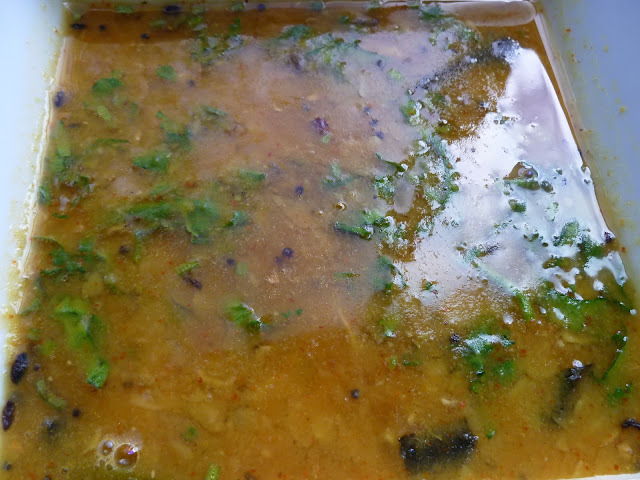 Cook the dal till mushy with green chillies, 1 of cups water and 1 /4 tsp of ghee. At this stage add ginger, salt, jaggery ,turmeric, chilli powder, coriander powder . Add some water may be quater to half cup or as needed . Mix well and let it boil for another 10 minutes on medium heat. Heat ghee , add fenugreek seeds, fennel seeds and mustard. Pour this tempering on the boiling daal and simmer for 5 minutes. Remove from fire ,add ghee , lemon juice and coriander leaves. Serve with boiled rice . i always prepared this dal!!! Delicious and perfectly done..Thanks Nisha !